Flashing back to when Carol left Rick in the neighborhood, she barely made it away from him before she broke down and cried. While a walker tried to break into the car, she just screamed at it and drove off. Finding a law office, she cautiously walked in and tried to lure any threats out with a little noise. She set up a space for herself to begin to live her life alone. In the distance, she saw the smoke (which happened during the fall of the prison). Pulling up to the wreckage to see the building on fire, she sat there stunned by the sight. In the present, Daryl and Carol talk about his time alone with Beth and the car that drove off with her. They try to plan for what to do about getting Beth back while following another car. Going down I-85, they arrive back in Atlanta and find themselves stopping in a dark area. The car ahead stops and a man dressed as a cop emerges. They keep their distance, but a walker almost blows their cover. They take care of the walker and realize that they need to find cover for the night when the car will not start up again. They sneak up to the law office where she once stayed during her exile. Hearing the moans of a herd of walkers growing in the distance, they quickly head inside and start searching the building. Daryl takes the keys off of a dead walker, while Carol leads them to a private office. They block the door and continue into the next room. Daryl realizes that Carol had lived in the place in the past and welcomes a chance to get some rest while she takes first watch. Before getting some sleep, they talk about attempting to start their lives over, but she admits that she no longer feels the hope of saving people. They both lay down on the bed for a moment before hearing some noise down the hall. Slowly making their way down, they come across walkers on the other side of a frosted-glass door. Daryl stops Carol from opening the door to deal with them and they head back to the room. The next morning, she wakes up to see smoke outside of the window. She spots Daryl carrying a body over to a fire and dropping it in, signifying that he dealt with the two walkers while she slept. 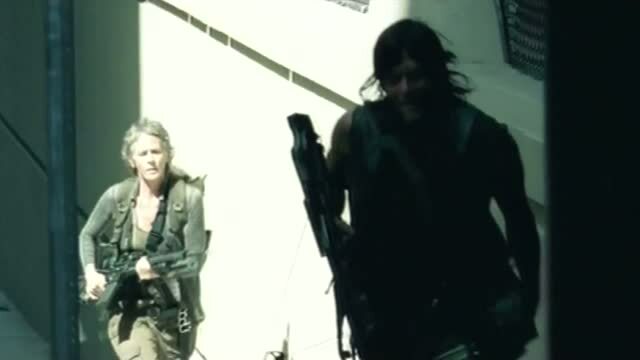 Carol gathers some supplies while Daryl devises a plan to try to spot their target. The streets of Atlanta are almost completely abandoned, except for the occasional group of walkers. Daryl spots a building with a bridge to serve as a good vantage point. He lights a pad of paper on fire and throws it to attract the walkers. Taking one out at the parking garage, they make their way to the top. Going inside the building, they find a group of walkers that had once been survivors living in camping gear. At the next door, they squeeze through while avoiding to break the chain holding it blocked. Entering a nice apartment, they see the destruction of the city out of the window. After a short conversation, Daryl spots a van in the distance. Squeezing back out of the door, they meet up with Noah at the wrong time. He confiscates their weapons and slashes open one of the tents. They take care of the walkers but lose Noah in the process. Carol starts to get down on herself for failing to survive the way she felt she needed to, but Daryl challenges her to rethink her current situation. She drops her bag, revealing that she kept the childhood trauma book from the law office apartment. Back on the street, Daryl and Carol make their way to the van, finding it halfway off of the bridge. They climb into the back and start to search for clues about their targets, but a herd of walkers are sneaking closer. They try to fight them off, but they are overpowered and retreat into the van. Searching for an exit, Daryl sees their only way out is to make the van fall. Landing right-side up, they are just a little worse for wear, but deal with the onslaught of walkers falling on the hood. Able to walk away, Carol appears to be a little more hurt and requires help as they depart for their next goal…the hospital. Stopping for a moment, Carol’s shoulder is definitely hurt but they choose to continue on for their observational mission. Daryl finds a walker with a machete and takes it. They find a spot to perch and watch the hospital across the way, while Carol recounts on her struggles and attempt at growth since the apocalypse. Daryl remains the optimist, but they get distracted by some noise down the hall. They notice a bolted walker that was attacked by a crossbow, leading Daryl right to Noah. A walker disrupts their approach, nearly getting Carol. Daryl chases down Noah, bodyslams him into a bookcase, and traps him underneath. Taking back their weapons, Daryl is ready to leave him to die to a walker trying to fight its way through a blocked doorway. Carol pleads with him to save the kid, which Daryl does only after letting him suffer for a few moments. Carol drags the body off of the bookcase and then lifts it to let Noah free. Noah starts to worry about getting found and mentions the hospital and knowing Beth. They try to get to safety, but Noah struggles to walk and lets Carol go ahead. She gets hit by the car searching for Noah and taken away on a stretcher. Daryl and Noah make their way out of the building and find a vehicle to escape the city. Reaction: A few flashbacks for Carol served as the backdrop for her progression to a hardened and nearly hopeless individual. The problem with her at the moment is that she fails to know what she believes about herself. Throughout the episode, she battles with Daryl’s optimism, while also keeping a book about dealing with abuse, hinting about her inability to fully move beyond her trauma with her ex-husband and the loss of Sophia and so many others. Though the book could also be her attempt at trying to help Daryl deal with his past. She acts tough in the right moments but turns somewhat listless in their moments of downtime. Daryl has given her something to hope for, but she seems to also be struggling to hang onto the idea of life after the apocalypse and after all that has happened. Daryl has another simply badass-style episode, where he gets to kill a bunch of walkers and trick Noah into thinking that he would actually leave a person to die the way it appeared under the bookcase. The van falling off of the bridge was a nice touch to add to his devil-may-care moments. His story is now caught up to the moment a few episodes back when he appeared in the dark back at the church, now easily revealed to be Noah. Noah’s inclusion in this episode was an interesting one, as he was actually a bit of a challenge for Daryl and Carol to deal with. Frightened after escaping from the hospital with Beth’s help, he felt like he needed to protect himself, even at the expense of these apparent calm but well-armed strangers. His bum leg was not going to let him get far, which happened to be the case when Daryl and Carol bumped into him closer to the hospital. He seems to be trying to be tougher than would be smart for him, as there was a chance that he was going to make a solo assault on the hospital to get Beth back. Daryl essentially stopped him but also gave him a chance to make a better decision to take on the hospital…Rick’s team. There was a little less in the development department of this episode, since it was so focused on Daryl and Carol’s story, but it set up the events to lead to the mid-season finale. Agreed on Noah. The kid looked more nervous than in “Slabtown,” given his leg and how he couldn’t make much ground without any sort of weapon, not to mention Beth still being at the hospital. But he was a bit of a challenge, leaving Daryl and Carol to fend with those walkers. 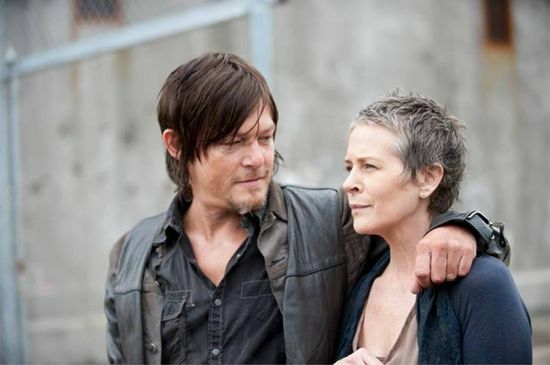 As far as the story goes, yes, not a lot happened since it had to set up what we’d seen revealed in episodes prior, but I did enjoy learning about Carol after her fallout with Rick and how she and Daryl had changed. The only thing I wish had been included was how Carol met up with Tyreese, Judith, Lizzie and Mika, but hey, that’s fairly minor.